I am both taking and teaching a class this semester. The class I'm taking is Spanish, and as it's a fairly accelerated class I find myself with much less time than I expected. But I'm learning Spanish, which is something I have intended to do since forever, and I've always been a little embarassed that I didn't speak it. So I'm fixing that. Hopefully, at the end of the class I'll head to Costa Rica and practice for a while. Teaching a class the second time around is both good and bad - I worry that my prep the first time wasn't good enough, and that therefore I won't be able to use my notes from last time to get through class. A class that lasts 85 minutes is stressful both from a performance point of view and from a pacing point of view - what do I do if I run out of stuff to talk about? But if today was any indication, what's actually going to happen is that I'm going to have too much to talk about. Which is also bad, but less bad. We seem to be in the first full week of Trump policy making, and it's so far been a long list of things I don't like. We'll see if things continue in this vein for the next four years. 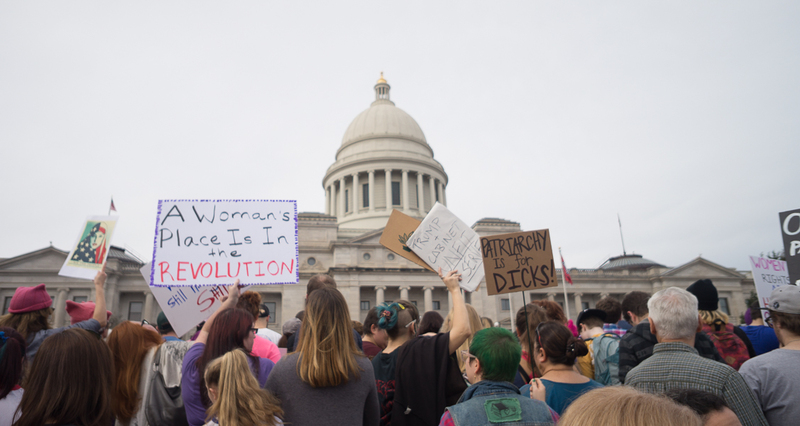 In the meantime, we had a giant march down in Little Rock the day after the inauguration, just to keep folks honest.